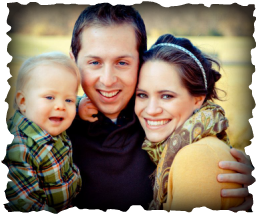 On Saturday, July 27, 2013, at around 4:30 p.m. the Lord allowed a bus accident to take Pastor Chad and Courtney Phelps and their unborn baby home to enjoy Him in His presence forever (Psalm 16:11; 2 Corinthians 5:8; Hebrews 11:13-16). Dozens of our children and teens from Colonial Hills Baptist Church in Indianapolis, IN, were returning from a week of camp when the accident occurred with the teen bus just minutes before their final destination. The Lord spared the lives of all 33 teenagers and 2 children on board and the bus driver although many are still recovering from significant injuries. God has shown his mercies in this tragedy (Psalm 103), and we glory in His sovereign goodness even in this great moment of suffering a pain (Psalm 119:68; Romans 8:28-30). We hold to the Biblical message of good news that Jesus Christ the Son of God willingly died upon a cross in order that we might be rescued from the penalty of sin. Our hope is in the resurrection of Jesus Christ from the dead on the third day. We of all people have an assured hope of eternity beyond the grave through His resurrection and life (John 10:21-27). Just days after the accident our Dad (Pastor Charles Phelps) stood before the church congregation at Colonial Hills Baptist Church and pleaded with the church family to "Fan the Flame" of revival that had been sparked as a result of this tragedy. We have heard of God drawing people to Himself in saving faith through this situation, we have heard of Christian's dedicating their lives to the Lord as a result of this tragedy, and we're amazed by a God who brings beauty out of ashes (Isaiah 61:1-3). For these reasons and many more, we rejoice, even as we sorrow! We hope that this short blog will be another way that we can "Fan the Flame." Our goal with this blog to encourage and bless our readership. We by no means have all the answers but we hope you can journey with us as we learn about our God through pain and suffering. July 27, 2013, was the scariest day of my life. I watched helplessly as the bus that my brother and sister-in-law were in flipped over right in front of me. I ran as fast as I could to the scene of the accident and found my nephew, Chase, lying on the road. I scooped him up and as I searched for my brother and sister-in-law I immediately began to pray. I prayed that God would save them both. On that day my brother, Chad, and his expecting wife, Courtney, were promoted to heaven - Today they are with Jesus. Courtney was a sweet, godly lady and a wonderful mother. Chad was my best friend. I miss Chad and Courtney more than I can say but I praise the Lord that the resurrection of Jesus from the tomb set in motion the defeat of all God’s enemies, including death. My prayers that God would save Chad and Courtney were answered. Chad and Courtney had both accepted Christ as their Savior and now are basking in his presence. As I grieve,I also reflect on the goodness of God. Little Chase was miraculously saved. He will forever remind us of his godly parents. My prayer for this blog is that we can continue to further the incredible ministry of Chad and Courtney. My desire is that this blog be a place people can come to and be encourage in their suffering, challenged in their spiritual walk and leave glorifying God. "You want to know what makes Jesus look beautiful? I'll tell you what makes Jesus look beautiful, It's when the church bus is flipped, and your brother, sister-in-law, and unborn niece go flying through the window and land like dead in the street, and you say through the deepest possible pain...God is enough. He is enough. He is good. He will take care of us. He will satisfy us. He will get us through this. He is our treasure. Whom have I in heaven but You? And on earth there is nothing that I desire besides You. My flesh, and my heart, and my brother and sister-in-law, and unborn niece may fail, but You are the strength of my heart, and my portion forever. That makes God look glorious. As God - not as giver of cars, or safety, or health. God is most glorified in you when you are most satisfied in Him - in the midst of loss, not prosperity." This is a quote I have edited that I used in the sermon I preached earlier and on July 27, 2013, at approximately 4:30 p.m. God made this my reality. My prayer for this blog is that through the efforts put forth we would be able to effectively use this testimony that God has given us to further his Gospel and comfort those in their time of need. Love for God and obedience to His Word. Love for the church and faithfulness to its work. Love for others and enthusiasm in ministry. Our goal is that these three core values be seen in everything we do on this blog.